If you’re anything like us, it’s easy to get stuck in the HOW loop! How are we ever gonna do that? How will we ever get from here to there? How can we make that happen? You see … when we concentrate on our circumstances, we tend to get stuck. Why? Because, we see all our problems. We focus on all the impossibilities. We live limited to what WE can accomplish. H … O … W (to) W … H … O … it changes EVERYTHING! When we make the switch to remember WHO, our mind to challenges us to ask different questions, like: WHO gave us this promise? WHO is HE? And what is HE capable of? The answers to those questions causes faith to rise within us and empower us to believe HIM for ALL HE promised. Today, take time praying by yourself and then with your mate. Consider the following thoughts, scripture, and make the application for your life and marriage. God continues to remind us; what got you to where you are is NOT enough to get you to where you are going. His gentle whispers, continue to call me to RISE UP … to BECOME ALL HE intended …to BELIEVE ALL HE’S promised … to REST in HIS provision. How about it? What’s God speaking to you? How is He calling you to grow? With what does He want you to trust Him? 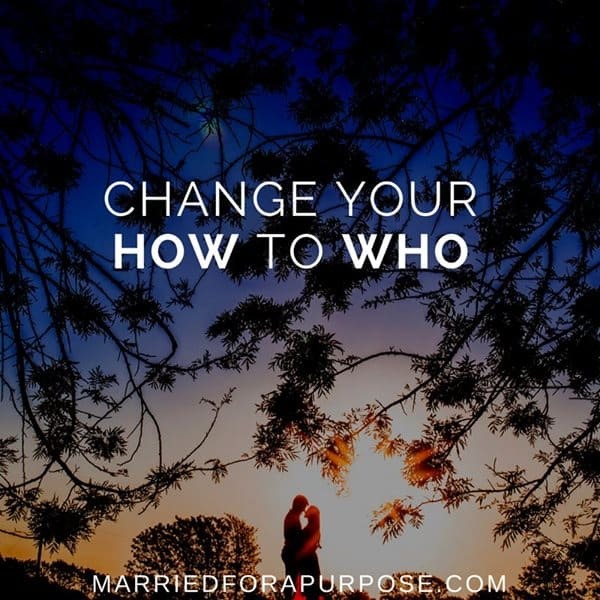 Father, help us to consistently change our HOW to WHO. We want to rest in YOUR abundance and follow you wherever You lead. Speak to us clearly and help us to follow you in full confidence that YOU will do ALL YOU have promised, in JESUS’ NAME we pray, AMEN!